Rhodes is a Greek island in the Aegean Sea that holds a city of the same name. It is the largest of the Dodecanese Islands in the Aegean Sea and also known as the Island of Roses. Currently, approximately 40 Jews live on the Island. The biblical reference to Rhodes is in Genesis 10:4–5. Dodanim, the son of Yavan (Greece) and the biblical figure after whom the Island of Rhodes is named and to whom it belonged, was Noah's great-grandson on the side of his son Yefet. It is written, "By these were the isles of the nations divided in their lands; everyone after his tongue, after their families, in their nations" (Gen. 10:5). Although it is uncertain when the first Jews settled in Rhodes, it appears that a Jewish community existed on the island at least toward the end of the Hellenistic period. Rhodes is listed in a Roman decree among those areas notified of the renewal of the pact of friendship between the Roman senate and the Jewish nation under the high priest Simeon (142 B.C.E. ), and numerous scholars have concluded from this document that a Jewish community existed on Rhodes at the time (cf. Suetonius, Tiberius 32, where a "Diogenes Grammaticus" is mentioned who used to dispute on the Sabbath; cf. also IG, XII, fasciculus 1, n. 11, line 5, where one should probably read "Menippus of Jerusalem"; cf. corrigenda, p. 206). Herod the Great had occasion to visit the island a number of times. His first visit was in 40 B.C.E. when, having set sail for Pamphylia on his way to Rome, he was nearly shipwrecked and with difficulty made his way to Rhodes. There, according to Josephus' account (Ant., 14:377–8, see also Wars, 1:280), he found the city devastated by the war against Cassius and "did not hesitate to help it even though he was in need of funds, but actually exceeded his means in restoring it." It is probable that he thereby intended also to benefit the local Jewish population. Following the battle of Actium (31 B.C.E.) Rhodes was the scene of a meeting between Herod and the victorious Octavian. On this occasion Herod proclaimed his loyalty and friendship to the new Roman emperor and as a result was reconfirmed king of Judea (Wars, 1:387–8, Ant., 15:187–8). Josephus states that Herod continued to offer economic aid to Rhodes: "again and again he made contributions for shipbuilding, and when their Pythian temple burnt down he rebuilt it on a grander scale at his own expense" (Wars, 1:424; Ant., 16:147). Jews are again mentioned in Rhodes at the time of the Arab conquest in the seventh century C.E. In 653 the Arab conqueror, Muʾāwiya, ordered the destruction of the remains of the Colossus of Rhodes. It was sold to a Jew from Edessa who carried away 90 camel loads of bronze (Theophrastus, Chronographia, 1:345). Benjamin of Tudela, the 12th-century traveler, found some 400 Jews in the city of Rhodes. Some Jews, upon fleeing Aragonese territory during the 1280 persecutions, went to Rhodes, then still under Arab rule. During the rule of the Knights Hospitalers of St. John of Jerusalem (1309–1522), the Jewish quarter (vicus Judeorum) was next to the city wall near the port. During the 38-day siege of the city by the Turks in 1480, the Jews fought valiantly in defense of the city. Their houses were torn down to reinforce the wall, and the fighting reached the synagogue before the Turks were forced to retreat. The grand master of the order, Pierre d'Aubusson, erected two churches on the site to commemorate the event and the synagogue had to be abandoned. In recognition of their bravery, the Jews were later allowed to rebuild it. Meshullam of Volterra and Obadiah of Bertinoro visited Rhodes in 1481 and 1488, respectively. The latter found only 22 Jewish families, the others having left after the 1481/82 earthquakes which again destroyed the Jewish quarter. The remnant was living in poverty, mainly on its womenfolk's earnings (the anonymous Pilgrim of Cologne noted the Jewesses' skill in making silk clothes), but some men worked in tanning. After a plague (1498–1500), the order decided to expel within 40 days all Jews who would not become baptized. They could leave with their belongings but had to sail for Nice, in order not to settle in Turkish territories. In the next two decades from 2,000 to 3,000 Jews captured by the order's ships, were brought to Rhodes, and kept there as slaves to work on fortifications. In 1522 these captives helped the Turks conquer the fortress of Rhodes. Under the benevolent Ottoman rule, Rhodes became an important Sephardi center, the Jews outnumbering the Turkish population. The community numbered 144 Jewish household heads during the reign of Suleiman the Great (1520–66), but the number was probably higher. Expulsees from Spain and Portugal, as well as returned anusim (Marranos) strengthened the Jewish community and fortified it as an important Judeo-Spanish-speaking center. Also some 150 Sephardi families were transferred from Salonika to Rhodes for economic and strategic reasons as part of the sorgun by order of the sultan in order to strengthen the population base. Jews from Izmir, Istanbul, and Jerusalem were also relocated there; as well as Jewish political prisoners. Rhodes became known as the "small Jerusalem." In the Ottoman period, the community had two main synagogues: Kahal Grande and Kahal Shalom, founded later, in 1577, and renovated in 1593. Noteworthy of the time was the 16th century local poet Judah Zarko, who published his work Leḥem Yehudah in 1560. Among the noteworthy rabbis of Rhodes were: Judah ibn Verga (16th century); Moses Bussal (17th century); Jehiel Bassan (18th century); Michael Jacob Israel (1790–1856) author of the responsa Yad Yamin; Judah Moses Franco, who became Rishon le-Zion in 1911; and, above all, the long line of the rabbis of the Israel family, beginning with Moses Israel of Ereẓ Israel, who was appointed chief rabbi of Rhodes in 1714. The Jews of Rhodes were merchants, manufacturers of arms, moneychangers, tax farmers, and physicians; the middle class were craftsmen: carpenters, tanners, goldsmiths, and bookbinders, and others made a well-known wine, silk clothes, and wove cloth. Moses de Vushal of Safed, chief rabbi of Rhodes in the mid-17th century, presided over a flourishing yeshivah on the island. He wrote Yismaḥ Moshe and lived in a time of messianic hysteria within the community prompted by the messianic activity of Shabbetai Ẓevi of nearby Smyrna (Izmir). Shabbetai Ẓevi stayed at the rabbi's house for a month in 1662 when he was en route to Ereẓ Israel. Rabbi Vushal's son, Solomon, became an ardent follower of Shabbetai Ẓevi. After this false messiah converted to Islam by order of the Ottoman authorities in September 1666 in order to avoid a death sentence, Solomon Vushal also converted to Islam, like many of Shabbetai Ẓevi's devout followers throughout the region and the world. The rabbis who followed Moses de Vushal had to cope with the problem of maintaining rabbinical authority due to the turbulence caused by Shabbateanism. The community also suffered a plague in 1667, which caused many to flee temporarily to the villages of the island. In the 18th centuries the community was led by the Chief Rabbis Ḥayyim Algazi; Shmuel Sadok; the above Moses Israel (1714–38); Ezra Malki (of Safed), who died in 1768; Moses ben Eliyahu Israel (Moses Israel II) of Jerusalem, who was appointed in 1773 but died at the early age of 34 in 1782; Jedidiah Samuel Tarica (whose family originated in Candia); and Ḥayyim Tarsa, author of the responsa Ḥayyim Shenayim and student of Rabbi Moses Israel II. Aharon Raḥamim Franco was the Austro-Hungarian consul in Rhodes beginning in 1769. In addition, he was appointed by the Emperor Franz Josef as minister of the post. The wealthier Jews were merchants in cloth, silk, sulfur, and resins, and the rest were small shopkeepers and artisans, ambulant vendors, and fishermen. In 1819, Behor Alhadeff founded a bank which later became Solomon Alhadeff and Sons. The bank eventually became a powerful financial house in the Levant and the family established commercial enterprises and clothing factories throughout the region. The community was governed by a council of seven memunim ("officials"). The council decided on taxes to be levied, and together with the rabbi it gave askamot ("decisions") on current matters. Government taxes were collected by a Jew who was appointed by the Turkish governor. The rabbi was recognized by the authorities as the judicial authority in all questions concerning marriage, divorce, inheritance, etc. The Kahal Gadol synagogue was built under Knights Hospitalers' rule, and the Kahal Shalom synagogue in 1593; there were also two small synagogues, Kahal Kamondo (from 1865) and Kahal Tikkun Ḥaẓẓot, called also Keila de los Vicos ("the Synagogue of the Rich"). There were many yeshivot used as meeting places for prayer and study, and many smaller prayer rooms called midrashim. The Israel yeshivah dated from the 17th century and Moses Menashe founded the Menashe yeshivah in 1850. His son Boaz "Effendi" was a Turkish judge. The education of boys was given over to private teachers, usually employed by a group of families. In 1882, Moses Franco, who also was the French vice consul, opened the modern Progress school where Hebrew, Turkish, and French were taught, but it closed after five years due to fierce objection from the local rabbis. In 1895, the noted educator and historian Abraham Galante founded the Tifereth Israel school, which had a similar curriculum and agenda as the progress school, but it only lasted two years. In 1899, he founded the talmud torah. In the early 1900s the Alliance Israélite Universelle opened separate boys' and girls' schools. The latter was opened when parents feared that their daughters who studied at the Catholics Soeurs school were exposed to proselytism and a 15-year-old girl converted to Catholicism. Life under Turkish rule was easy, except in 1840 when in the wake of the Damascus blood libel the rabbi and the leading members of the community were arrested and held until the innocence of the Damascus Jews was proven. According to various reports, the number of Jews during the 19th century was between 2,000 and 4,000. At the end of the 19th century, young poorly educated teenage boys from Rhodes began migrating to Africa to search for a better future with dreams of getting rich. Eventually, they reached the Belgian Congo and Rhodesia and founded synagogues in Elizabethville and Salisbury. At the beginning of the 20th century, Rhodian Jews also followed Greek-Orthodox fellow townsmen to the United States and South America. Among the noted rabbis of the second half of the 19th century was Ḥayyim Raḥamim Joseph Franco (b. 1835; "the Ḥarif"), who wrote Sha'arei Raḥamim, Shenot Yamim, Ot le-Raḥamim, Midat ha-Raḥamim, and Kevod Ya'akov. He was av bet din locally and later in Livorno and Jerusalem (1868), and finally served as chief rabbi of Hebron (1878–1901). Reuben Eliyahu Israel was the last chief rabbi of Rhodes, appointed in 1921 and serving until his death in 1932. The Maḥzor Sefarad was used by all; parts of prayers and especially piyyutim were recited in Ladino. Before marriages, the dowry was assessed and the amount inscribed in a register and later in the ketubbah; the dowry was exhibited on carts in the Jewish quarter. On the Sabbath after the marriage the groom was called to the tevah and recited Abraham's order to his servant to find a bride for his son Isaac in Mesopotamia (Gen. 24); the congregation sang each verse in the Aramaic Targum. Those who recovered from serious illness or grave danger would offer a sacrifice – a cow or sheep – whose blood the shoḥet would smear on the door and the doorposts. In 1912, after the Balkan Wars, Rhodes and other Dodecanese islands came under Italian rule. There were about 4,500 Jews in Rhodes at the time. Rhodes became the center of the Italian possessions in the Levant and Italian Jews settled on the island. An Italian rabbinical seminary, the Collegio Rabbinico, was founded by the Italian government in 1928 to serve the Italian Levant (the Balkans, Ereẓ Israel, Egypt, and Ethiopia); it was closed in 1938 before the Fascist racial laws were promulgated. It was headed by such scholars and luminaries as Rabbi Marcus Breger, Riccardo Pacifici, Prof. Isaiah Sonne, and Rabbi Michel Albagli. The musicologist Albert Hemsi did important fieldwork with Rhodian Judeo-Spanish speaking Jews to annotate their knowledge of romances, coplas, and other cultural literary forms and religious musical rituals. Jews who had arrived in Rhodes after 1919 (103 families from Bulgaria, Greece, and Turkey) were expelled and most of them sailed for Tangier. Others later fled in the face of the discriminatory measures, mainly to the Belgian Congo and Rhodesia; where Rhodian enclaves had existed since the early 20th century. Some 200 local Jews embarked the illegal immigration boat Rim to Ereẓ Israel after its North European Jewish passengers on the shipwrecked Agios Nikolaos had been stranded in Rhodes for six weeks and housed at the local stadium. After the capitulation of Italy to the Allies in September 1943, the Germans occupied Rhodes, and on July 24, 1944, deported to Auschwitz all of the 1,820 Jews who were left on the island; only 179 survived. The future UN Secretary-General and Austrian President Kurt Waldheim, then a young Wehrmacht Intelligence officer, was present for the collection of gold when the Rhodian Jews were interned at the Chemenlik warehouses, formerly an early Ottoman aeronautical base, and assisted in arranging logistics for their deportation to the Haidari Camp in Piraeus, from which they would be deported to Auschwitz/Birkenau. Twenty-nine-year-old Turkish consul and Righteous Gentile Salahattin Ulkumen saved some 46 Jews from deportation. The rise of Zionism during the late 19th century resulted in an influx of emigration to Palestine. Emigration continued throughout the early 20th century, though primarily due to financial and professional reasons rather than ideological visions. As the situation in the Ottoman Empire deteriorated, more people left home. The primary destinations grew to includ the Congo, Zimbabwe, and the United States. Others also went to South America, other countries in Africa, and to Palestine. These immigrants kept in touch with their home community, often returning to Rhodes temporarily to find a bride or visit family. The Jews also did their best to maintain their own heritage and traditions in their new homes. Another sizeable portion of the community emigrated from Rhodes in 1938 and 1939 due to anti-Semitic policies under Italian governance. The Italian government’s anti-Semitic laws in September 1938 caused 2,000 Jews to flee Rhodes, half the population. Italy allowed Germany to share control of Rhodes. In September 1943, the Italian military surrendered control completely to the Germans. On July 18, 1944, the male Jews of Rhodes aged 16 and older were ordered by the German military to appear with their identity cards and work permits at the Air Force Command Center. The men that assembled the next day were brutalized and threatened. Their permits and ids were taken and they were herded into the basement of the building. On July 19th, the remaining Jewish women and children were ordered to appear with their valuables. Once they did, their valuables were stripped from them. On July 23rd, 1,673 Jews were loaded onto three crowded boats and spent eight miserable days traveling to Greece. Once on the mainland, the Jews were herded into cattle cars and sent to be exterminated at Auschwitz. Only 151 survived. After the war, the 50 people who had survived on account of their Turkish nationality left the island for Turkey, Palestine, Africa or the US. Those who survived the concentration camps were subject to the psychological trauma and social hardships experienced by most other Jews. The community was reestablished in Rhodes thanks in large part to the Central Board of Jewish Communities in Greece that encouraged and supported twenty Jewish families to settle on Rhodes. In the early 21st century, there were only thirty-seven Jews in all of Rhodes. Rhodes was home to six synagogues. The oldest, Kahal Kodesh Gadol, dated back to the 15th century but was destroyed during WWII. Most of the others were founded in the 19th century. 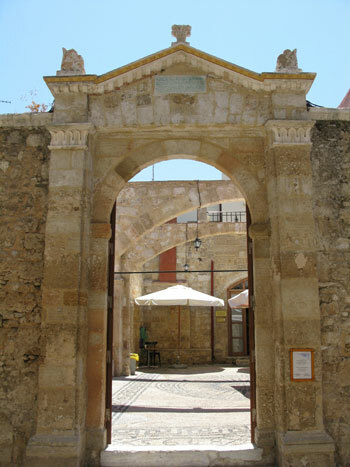 The Jewish Museum of Rhodes was founded in 1997 and houses documents, photographs, and exhibits on the history of the Jewish community in Rhodes. It was renovated from 2004-2006. When Rhodes became a part of Greece in 1947, some 50 Jews lived there. In 1969 there were 32 Jews on Rhodes. In the early 21st century some 20 Greek Jews lived in the city of Rhodes and the Kal Grande synagogue functioned and also served as a museum for the history of Rhodian Jewry. Despite the destruction of Rhodian Jewry in the Holocaust, an active Rhodian Diaspora still exists. In addition to the above-mentioned communities in the Diaspora, the former Rhodian Jews and their descendants relocated after the nationalization of the Belgian Congo in the 1960s and established communities in Seapoint, outside of Capetown, South Africa, and Brussels, Belgium; each having a Rhodian synagogue building. From this exodus, a Rhodian enclave was also created in Ashdod, Israel. A second-generation group in Israel, led by the Jerusalemites Mario Soriano, Maggie Cohen, and Dr. Yehuda Leon, publishes a periodical called Ahi Rhodes, and produced a film called Rhodes: Story of a Community that Disappeared. The Kahal Shalom Synagogue is the only remaining synagogue used for services on the Island of Rhodes and is the oldest in all of Greece. 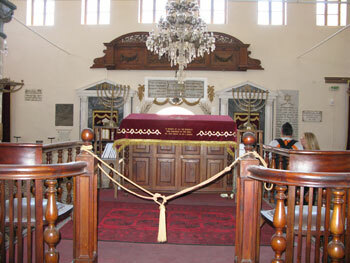 Built in 1577, the synagogue is currently located on Dossiadou and Simiou Streets. The Synagogue was built in the traditional Sephardic style indicative of the Jews’ ancestors. 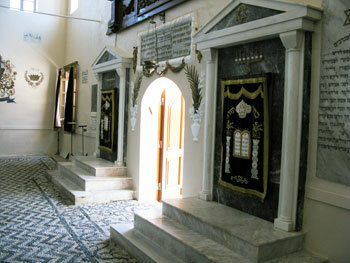 The Jews in Rhodes are primarily descendents of Jews who fled Spain during the Spanish inquisition. There is a reading table in the center and a women’s balcony that overlooks the lower room of the sanctuary where the men pray. The balcony was built in the 1930’s to replace the backrooms with small latticed barriers that women used to be allotted. The floor of the building has black and white mosaic stones. On the east side of the synagogue is a courtyard containing a plaque with an inscription of the founding date of the synagogue: Kislev, 5338 (1577). On the west side of the synagogue is a courtyard that until World War II held a library. Also on the west site is a plaque with the names of the families killed in the Holocaust. The eastern wall has a unique feature in that at either side of the central door there is an Ehal, a marble niche where the sacred books of the Torah are kept. Dr. Richard Freund, Director of the Maurice Greenberg Center for Judaic Studies at the University of Hartford in Hartford Connecticut, is preserving the memory of the Rhodesian Jewish community through the University exhibit, “It was Paradise: Jewish Rhodes.” Freund participated in the excavation of the Kahal Shalom Synagogue, and was inspired to teach others about the Rhodesian Jewish community as, “a way of not giving Hitler a posthumous victory.” The exhibit at the University has many artifacts from the excavation on display, such as a pair of mikveh slippers, 50 ancient coins, and various pottery shards. A. Galanté, Histoire des Juifs de Rhodes, Chio, Cos etc. (1935; appendix 1948); R. Pacifici, in: RMI, 8 (1938), 60–77; S. Marcus, Toledot ha-Rabbanim le-Mishpaḥat Yisrael me-Rodos (1935); idem, in: Sefunot, 1 (1956), 279–302; idem, in: Oẓar Yehudei Sefarad, 2 (1959), 55–68; Schuerer, Gesch, 3 (19114), 456, 534; Juster, Juifs (1914), 189; B.E.A. Rottiers, Inscriptions et Monuments de Rhodes (1830); Baron, Social, 3 (1957), 16, 235; J. Starr, Romania (1949), 85–93; M. Ishon, in: Gesher, 11 (1965), 51–57; M.D. Angel, The Jews of Rhodes, The History of a Sephardic Community (1978). ADD. BIBLIOGRAPHY: B. Rivlin, "Rhodes," in Pinkas ha-Kehillot Yavan (1999), 392–407; Y. Kerem, "The Migration of Rhodian Jews to Africa and the Americas from 1900–1914: The Beginning of New Sephardic Diasporic Communities," in: Patterns of Migration, 1850–1914 (1996), 321–34; idem, "The Settlement of Rhodian and Other Sephardic Jews in Montgomery and Atlanta in the Twentieth Century," in: American Jewish History 85, 4 (Dec. 1997), 373–91.